Put the finishing touches on your print-on-demand product by taking advantage of our high-quality custom framing services. Choices include Knotty Pine, Rough Cut Cedar, Canadian Walnut, Birch, Old World Silver, Brushed Aluminum, or Contemporary Black. All frames purchased from our online store include a foam-core backing and plexiglass for added protection; these are options with other custom framing jobs. For the Rough Cedar and Knotty Pine frame styles add 3 inches to all sides of a map. In other words, add 6 inches to the dimensions of the map ordered. For ALL other frame styles add 2 inches to all sides of a map. 4 inches to the dimensions of the map ordered. Please allow 2-3 weeks for delivery for framing. 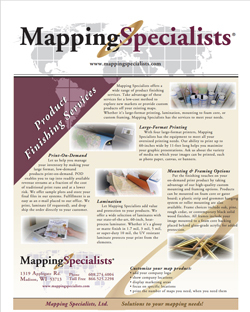 Large-size wall maps are prohibitively expensive to ship, so are only available for pickup at the Mapping Specialists office. If you would like to make other arrangements, please contact us.